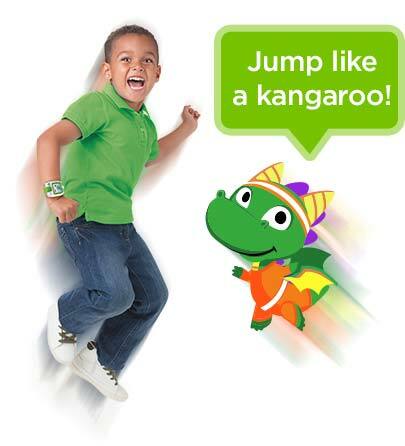 Preload LeapBand with 50 active challenges that get kids moving, like - ?Pounce like a lion!" Discover the only activity tracker made for kids that encourages active play and healthy habits with 50 fun challenges! Kids can have a good time getting active with a customizable pet pal as they play games and complete challenges together. Earn points and unlock rewards for being active, caring for a pet pal and completing challenges. It's fit made fun-just for kids! Using similar motion tracking technology as the current generation of expensive adult activity trackers, LeapBand accurately measures a child's activity throughout the day. Kids can follow their activity progress on the energy bar that moves around the LeapBand screen. Every jump, wiggle, run and dance earns points to unlock fun, new rewards. Designed just for kids, the controls are easy to use and intuitive. Animated graphics and audio challenges add fun and encouragement for kids. LeapBand goes beyond the ABCs to get kids moving and playing to support their overall health and wellness. The first-ever activity tracker created for kids, LeapBand features a pet pal, interactive games and daily challenges that keep kids engaged and excited to reach goals. LeapBand tracks a child's accomplishments and rewards them with more fun. Keep kids engaged and learning with mini-games like Pet Boogie, and Pet Chef. In Pet Boogie, create and practice a pet dance; and in Pet Chef, help a pet collect food and make healthy snacks. Plus, they can play in their pet's world: Visit the Pet Parlor and pamper pets with a glitter soap bath, or collect new pet toy rewards in Pet Play. 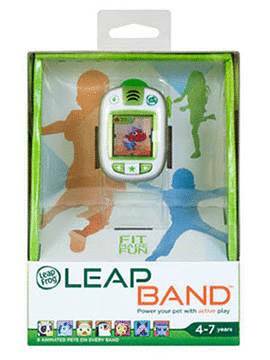 LeapBand comes preloaded with 10 imaginative and active play challenges and 4 cool-down challenges. Parents can add up to 36 more challenges in LeapFrog Connect so kids will hear fun activity prompts such as "March like an elephant" or "Wiggle like a bug." LeapBand features parent controls to further personalize the experience, including School and Quiet modes. Set LeapBand School mode to lock all game and pet play; in School mode, LeapBand continues to track your child's activity points and displays watch functions. Press a combination of buttons on the LeapBand to enter Quiet mode to mute game play any time. LeapBand comes with 8 different virtual pets: cat, dog, dragon, monkey, panda, penguin, robot and unicorn. Select one of the eight pets, then customize its color and name. As kids get active with LeapBand, they'll earn points to unlock more pets and fun pet accessories to personalize, nurture and play with as they complete physical challenges and games. Research shows that active play and physical movements are critical to children's health. LeapBand is designed to facilitate physical activities in a fun, imaginative, and engaging way, supplemented by LeapBand's virtual pets and an accompanying app that offer age-appropriate lessons about health and nutrition. LeapBand can be a great tool to support a child's healthy development. 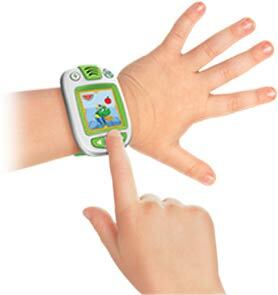 The LeapFrog Petathlon Games App expands the play of LeapFrog's LeapBand, the only activity tracker just for kids. Kids earn points for being active with LeapBand, which can be used in six events in the app. Customized digital pets like dragons, unicorns, penguins and more compete in fun-filled competitions to win medals and pet accessories that sync back to LeapBand. Best of all, kids will learn about staying active and being healthy while they play. It's the perfect motivation to get kids moving! LeapBand has a rechargeable battery that last 3-4 days depending on usage. To charge your LeapBand, use the included USB cord and insert into a USB port on your personal computer. Similar to LeapFrog tablets, the LeapBand includes a layer on the screen so that if in an extreme case the screen breaks it will not shatter. No. LeapBand comes 50-60% charged out of the box and is ready to play. To maximize play experience, including customizing challenges and setting School Time, it is suggested you set up the device via LeapFrog Connect. There are three ways to limit play time on the LeapBand. On Device: Silent Mode - hold left arrow button down for 5 seconds. This will put the device into and out of quiet mode. LeapFrog Connect: School Mode and Night Mode - This mode can be scheduled up to two times in a 24-hour period. School Mode and Night Mode can be turned off only through LeapFrog Connect. Yes, it was built from the inside out just for kids to be kid-tough. All LeapFrog products go through rigorous drop-testing to ensure durability and high quality. 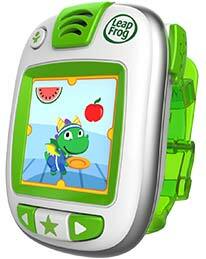 LeapFrog Wi-Fi tablets, select iOS and Android devices. 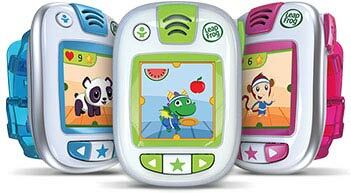 LeapFrog Enterprises is the leader in educational entertainment for children including tablets for kids and learning toys. LeapFrog's award-winning products are a perfect blend of educational expertise, personalized solutions and a child's love for fun, to help children of all ages achieve their potential. LeapFrog kids tablets, toys and curriculum have brought pure learning fun to millions of children worldwide, helping them prepare for school and life success.